Perplexed in the extreme, .......... is perfectly just. He is the most romantic figure among Shakespeare's heroes, and he is so partly from the strange life of war and adventure which he has lived from childhood. He does not belong to our world, and he seems to enter it we know not whence-almost as if from wonderland. There is something mysterious in his descent from men of royal siege; in his wandering in vast deserts and among marvelous people; in his tales of magic handkerchiefs, his being sold to slavery. Othello is not merely a romantic figure; his own nature is romantic. He has not, indeed, the meditative or speculative imagination of Hamlet; but in the strictest sense of the word he is more poetic than Hamlet. The sources of danger in this character are revealed but too clearly by the story. In the first place, Othello's mind, for all its poetry, is very simple. He is not observant. His nature tends outward. He is quite free from introspection, and is not given to reflection. Emotion excites his imagination, but it confuses and dulls his intellect. On this side he is the very opposite of Hamlet, with whom, however, he shares a great openness and trustfulness of nature. In addition, he has little experience of the corrupt products of civilized life, and is ignorant of the European Woman(venetians). Could neither gaze nor pierce? Puffed his own brother-and can he be angry? Lastly, Othello's nature is all of one piece. His trust, where he trusts, is absolute. Hesitation is almost impossible to him. He is extremely self-reliant, and decides and acts instantaneously. Love, if he loves, must be to him the heaven where either he must live or bear no life. If such a passion as jealousy seizes him, it will swell into a well-nigh incontrollable flood. He will press for immediate conviction or immediate relief. Convinced, he will act with the authority of a judge and the swiftness of a man in mortal pain. This character is so noble, Othello's feelings and actions follow so inevitably from it and from the forces brought to bear on it, and his sufferings are so heart-rendering, that he stirs, I believe, in most readers a passion of mingled love and pity which they feel for no other hero in Shakespeare. Why Othello didn't suspect Iago? Othello, we have seen, was trustful, and thorough in his trust. He put entire confidence in the honesty of Iago, who had not only been his companion in arms, but, as he believed, had just proved his faithfulness in the matter of the marriage. This confidence was misplaced, and we happen to know it; but it was no sign of stupidity in Othello. For his opinion of Iago was the opinion of everyone who knew him: and that opinion was that Iago was before all things 'honest', his very faults being those of excess in honesty. Therefore, it would be quite unnatural in him to be unmoved by the warnings of an honest friend, warnings offered with extreme reluctance and manifestly from a sense of a friend's duty, any husband would have been troubled by them. Iago does not bring these warnings to a husband who had lived with a wife for months and years and knew her like his sister or his bosom-friend. But he was newly married; in the circumstances he cannot have known much of Desdemona before his marriage; and further he was conscious of being under the spell of a feeling which can give glory to the truth but can also give it to a dream. This consciousness in any imaginative man is enough, in such circumstances, to destroy his confidence in his powers of perception. In Othello's case, after a long and most artful preparation, there now comes, to reinforce its effect, the suggestions that he is not an Italian, nor even European; that he is totally ignorant of the thoughts and the customary morality of venetian women; that he had himself seen in Desdemona's deception of her father how perfect an actress she could be. These suggestions are followed by a tentative but hideous and humiliating insinuation of what his honest and much-experienced friend fears may be the true explanation of Desdemona's rejection of acceptable suitors, and of her strange, and naturally temporary, preference for a black man. However, in spite all of those situations and suggestions, still he is not jealous, he furiously demands proof, ocular proof. When he gets the proof of the handkerchief; the "madness of revenge" is in his blood, and hesitation is a thing he never knew. The Othello of the Fourth Act is Othello in his fall. His fall is never complete in this act, but he is much changed. So, in the Fourth Act 'Chaos has come', for it was necessary for Iago to hurry on; his insight into othello's nature taught him that his plan was to deliver blow on blow, and never to allow his victim to recover from the confusion of the first shock. 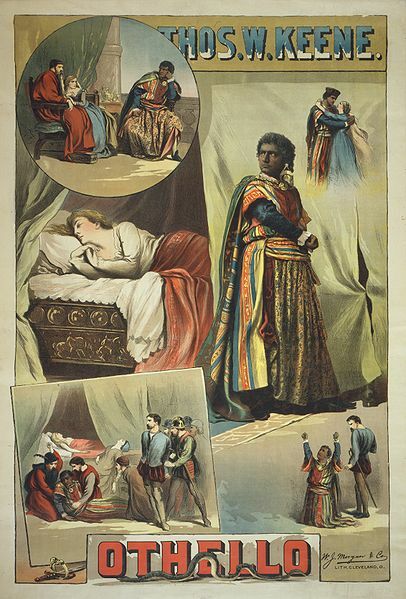 When Othello forgot the handkerchief incident; he told him another lie that Cassio himself confessed to Iago his guilt (relation with Desdemona). "It is the cause, it is the cause my soul,"
is not the man of the Fourth Act. The deed he is bound to is not a murder, but a sacrifice. He is to save Desdemona from herself, not in hate but in honor and in love. His anger has passed; a boundless sorrow has taken its place. It strikes where it doth love." Innocence, gentleness, sweetness, lovingness were the salient and, in a sense, the principal traits in Desdemona's character. Coleridge, and still more the American writers, regard her love, in effect, as Brabantio regarded it, and not as Shakespeare conceived it. They are simply blurring this glorious conception when they try to lessen the distance between her and Othello, and to smooth away the obstacle which his 'visage' offered to her romantic passion for a hero. Desdemona, the 'eternal womanly' in its most lovely and adorable form, simple and innocent as a child, ardent with the courage and idealism of a saint, radiant with that heavenly purity of heart which men worship the more because nature so rarely permits it to themselves, had no theories about universal brotherhood, and no phrases about 'one blood in all the nations of the earth' or 'barbarian, Scythian, bond and free'; but when her soul came in sight of the noblest soul on earth, she made nothing of the shrinking of her senses, but followed her soul until her senses took part with it, and 'loved him with the love which was her doom.' It was not prudent. It even turned out tragically. She met in life with the reward of those who rise too far above our common level; and we continue to allot her the same reward when we consent to forgive her for loving a brown man, but find it monstrous that she should love a black one. There is perhaps a certain excuse for our failure to rise to Shakespeare's meaning, and to realize how extraordinary and splendid a thing it was in a gentle Venetian girl to love Othello, and to assail fortune with such a 'downright violence and storm' as is expected only in a hero. It is that when first we hear of her marriage we have not yet seen the Desdemona of the later Acts; and therefore we do not perceive how astonishing this love and boldness must have been in a maiden so quiet and submissive. And when we watch her in her suffering and death we are so penetrated by the sense of her heavenly sweetness and self-surrender that we almost forget that she had shown herself quite as exceptional in the active assertion of her own soul and will. She tends to become to us predominantly pathetic, the sweetest and most pathetic of Shakespeare's women, as innocent as Miranda and as loving as Viola, yet suffering more deeply than Cordelia or Imogen. And she seems to lack that independence and strength of spirit which Cordelia and Imogen possess, and which in a manner raises them above suffering. She appears passive and defenseless, and can oppose to wrong nothing but the infinite endurance and forgiveness of a love that knows not how to resist or resent. She thus becomes at once the most beautiful example of this love, and the most pathetic heroine in Shakespeare's world. Desdemona does not shrink before the senate; and her language to her father, though deeply respectful, is firm enough to stir in us some sympathy with the old man who could not survive his daughter's loss. Commend me to my kind lord. O, farewell!" Evil has nowhere else been portrayed with such mastery as in the character of Iago. However, there is a false interpretation of his character which falls into two groups. 1) Iago is simply a man who has been slighted and revenges himself. 2) A Husband who believes he has been wronged and will make his enemy suffer a jealousy worse than his own. 3) Ambitious man determined to ruin his successful rival. 4) A combination of these, endowed with unusual ability and cruelty. This group contains the more popular views; however, the second group though much smaller it contains much weightier matter than the first. 1) Iago is a being who hates good simply because it is good, and loves evil purely for itself. 2) Coleridge: His action is not prompted by any plain motive like revenge, jealousy or ambition. It springs from a "motiveless malignity", or a disinterested delight in the pain of others; and Othello, Cassia and Desdemona, are scarcely more than the material requisite for the full attainment of this delight. Iago's nationality: it has been held that he is a study of that peculiarly Italian form of villainy which is considered both too diabolical for an Englishman. Not to believe a syllable Iago utters: on any subject, including himself, until one has tested his statement by comparing it with known facts and with other statements of his own or of other people, and by considering whether he had his own or of other people, and by considering whether he had in the particular circumstances any reason for telling a lie or a truth. Iago was a venetian soldier eight-and-twenty years of age, who had seen a good deal of service and had a high reputation for courage. We are ignorant of his origin, but he was not of gentle birth or breeding. He was married to a wife who evidently lacked refinement, and who appears in the drama in the relation of a servant to Desdemona. His manner was that of a blunt, bluff soldier, who spoke his mind freely and plainly. Seeing that his satire was humorous, that on serious matters he did not speak lightly, and that the one thing perfectly obvious about him was his honesty. "Honest' is the word that springs to the lips of everyone who knows him. It is applied to him some fifteen times in the play. In fact, he was one of those sterling men who, in disgust at gush, say cynical things which they do not believe, and then, the moment you are in trouble, put in practice the very sentiment they had laughed at. Even his wife doesn't suspect him, her nature was not very delicate or scrupulous about trifles. She never dreamed he was a villain, and there is no reason to doubt the sincerity of her belief that he was heartily sorry for Cassio's disgrace. Even when the idea strikes her that some scoundrel has poisoned Othello's mind, the tone of all her speeches and her mention of the rogue who (she believes) had stirred up Iago's jealousy of her, prove beyond doubt the thought Iago's being the scoundrel has not crossed her mind. Even if Iago had betrayed much more of his true self to his wife than to others, it would make no difference to the contrast between his true self and the self he presented to the world in general. What further conclusion can be drawn from this contrast? Iago was able to find a certain relief from the discomfort of hypocrisy in those caustic or cynical speeches which, being misinterpreted, only heightened confidence in his honesty. They acted as a safety-value, very much as hamlet's pretended insanity did. He was by no means a man of strong feelings and passions, but decidedly cold by temperament. Even so, his self-control was wonderful, but there never was in him any violent storm to be controlled. Although he was thoroughly selfish and unfeeling, was not by nature malignant nor even morose, but, on the contrary he had a superficial good-nature, the kind of good-nature that wins popularity and is often taken as the sign, of a good heart. The tragedy of othello is his tragedy too. it shows us not a violent man, who spends his life in murder, but a bad cold man who is at last tempted to let loose the forces within him and is at once destroyed. He has very remarkable powers both of intellect and will. - Iago's insight, within certain limits, into human nature. - His ingenuity and address in working upon it. - His quickness and versatility in dealing with sudden difficulties and unforeseen opportunities. - He seems to be master of all the motions that might affect his will. (Ex: In the most dangerous moments of his plot, when the least slip or accident would be fatal, he never shows a trace of nervousness). (Ex:When Othello takes him by the throat he merely shifts his part with his usual instantaneous adroitness). - He is equally unassailable by the temptations of indolence or of sensuality. - It is difficult to imagine him inactive and though he has an obscene mind, and doubtless took his pleasures when and how he chose, he certainly took them by choice and not from weakness, and if pleasure interfered with his purposes the holiest of ascetics would not put it more resolutely by "What should I do?" Roderigo: "I confess it is my shame to be so fond; but it is not in my virtue to amend it". I all depends on our will. Love is merely a lust of the blood and a permission of the will"
- He is the lordship of the will, which is his practice as well as his doctrine, is great, almost sublime. In intellect and in will Iago is great. To what end does he use these great powers? - He has a definite creed: absolute egoism is the only rational and proper attitude, and that conscience or honor or any kind of regard for others is an absurdity. He doesn't deny that it exists. - He appears, when we meet him, to be almost destitute of humanity, of sympathetic or social feeling. - He shows no trace of affection, and in presence of the most terrible suffering he shows either pleasure or an indifference. - We shouldn't ignore the extraordinary deadness of feeling, but it is also important not to confuse it with a general positive ill-will. When Iago has no dislike or hostility to a person he does not show pleasure in the suffering of that person: he shows at most the absence of pain. What is it that provokes his dislike or hostility? Certainly he is devoted to himself. However, what is clear is that Iago is keenly sensitive to anything that touches his pride or self-esteem. He has a high opinion of himself and a great contempt for others. Whatever disturbs or wounds his sense of superiority irritates him at once. This is the reason of his jealousy of Emilia. He doesn't care for his wife; but the fear of another man's getting the better of him, and exposing him to pity or derision as an unfortunate husband. He has a spite against goodness in men, not from any love of evil for evil's sake, but partly because it annoys his intellect as a stupidity; partly, because it weakens his satisfaction with himself, and disturbs his faith that egoism is the right and proper thing, partly because, the world being such a fool, goodness is popular and prospers. But he, a man ten times as able as Cassio or even Othello, does not greatly prosper. This wound his pride. Those feelings are constantly present in him. Why did he act as we see him acting in the play? He says more than once that he "hates" Othello. He gives two reasons for his hatred. The first reason is that Othello has made Cassio lieutenant. The second is that he suspects and heard it reported, that Othello has an intrigue with Emilia. There is Cassio, he never says he hates cassia, but he finds in him three causes of offense. First, Cassio has been preferred to him. Second, he suspects him too of an intrigue with Emilia. Third, Cassio has a daily beauty in his life which makes Iago ugly. Is the account which Iago gives of the causes of his action the true account? Iago is impelled by passions, a passion of ambition and a passion of hatred. Coleridge says: "it is a motive-hunting." Hazlitt says: He is an amateur of tragedy in real life." Bradley's view: The very honor of him he has less passion than an ordinary man, and yet he does these frightful things.Iago did not clearly understand what was moving his desire; though he tried to give himself reasons for his actions. Once he appears to see something of the truth when he uses the phrase "to plume up my will in double knavery", he means to heighten the sense of power or superiority. This seems to be the unconscious motive of many acts of cruelty which evidently do not spring chiefly from ill-will. His thwarted sense of superiority wants satisfaction. "What fuller satisfaction could it find than the consciousness that he is the master of the generals who has undervalued him and of the rival who has been preferred to him; that these worthy people, who are so successful and popular and stupid are mere puppets in his hands, but living puppets, who at the motion of his finger must contort themselves in agony while all the time they believe that he is their one true friend and comforter? "By the mass, 'tis morning." Delight in the exercise of artistic skill: He is not simply a man of action; he is an artist. His action is a plot, the intricate plot of a drama, and in the conception and exception of it he experiences the tension and the joy of artistic creation. Such then, seem to be the chief ingredients of the force which liberated by his resentment at Cassio's promotion, drives Iago from inactivity into action and sustains him through it. This force completely possesses him; it is his fate. Which is himself has completely mastered him, in the later scene, where the improbability of the entire success of a design built on so many falsehoods forces itself on the reader, Iago appears as a man absolutely infatuated and delivered over to certain destruction. In conclusion, Iago's failure in perception is closely connected with his badness. He was destroyed by the power that he attacked, the power of love. He was destroyed by this power because he could not understand it and was not in him. Iago never meant his plot to be so dangerous to himself. He knew that jealousy is painful, but the jealousy of a love like Othello's he could not imagine, and he found himself involved in murders which were no part of his original design.